Welcome to my world of yoga, mantras & all the other wonderful things which I would like to share with you. Mantras are a combination of sounds and phrases, which have been known in India for thousands of years. Through their power they have strong effects on the mind and body. By chanting a mantra, the entire mind and intellect are energized. The mantras by myself and Guru Atman have a specific meaning, which I interpreted in the refrain (chorus). When you chant the mantra with devotion, it gives the you great benefits. Enjoy yourself! Global Beats have always been my hobby horse. My musical teamwork with Guru Atman started in the Goa- & Tribal Beats scene, where we used to play gigs. 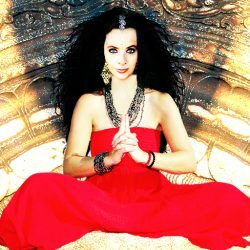 In the meantime Guru Atman has become quite popular with some Yoga Music albums and I am glad to have some very nice fans because of my Yoga workouts. That all led to my Yoga Mantra project.